New York, NY - VP Records’ iconic “Strictly the Best” compilation series is back with two new albums (Volume 56 & 57) that set the standard in today’s hottest Reggae and Dancehall music. Both volumes will be available for physical worldwide distribution on November 17th. Volume 56 is now available for pre-order. 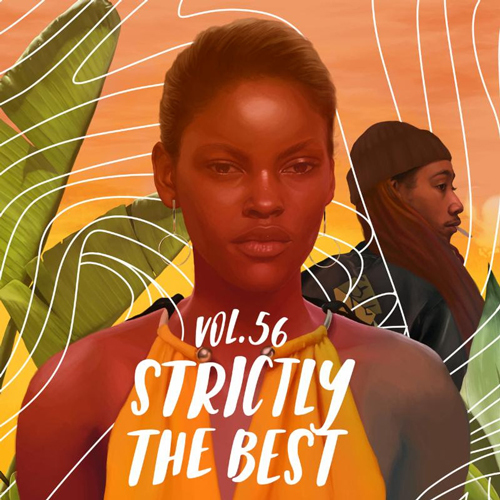 Volume 56 features current and emerging lover’s rock and roots reggae jams such as “Trouble” from Romain Virgo and “Better than the Stars” from Christopher Martin, in addition to exclusives such as “This Is Love” from Gentleman, “Smile from Jah-Lil, and “No Soul, No Heart, No Love” from Junior Kelly. Other standouts include ‘Hustling’ by Huntington Beach California based band Simpkin Project who recently released their album “Beam of Light” on Dub Rockers label (A VP Records imprint) on September 29th. Newcomer Spiritual’s passionate ‘Time has Come’ is also a gem on the compilation. A new remix to ‘Would you Love Me’ by Grammy nominated band Raging Fyah featuring Brazil's Cidade Negra and Queen Ifrica’s ‘All That I’m Asking’ and more bring the album full circle. The concept of the cover, designed by illustrator Kim Wells (@kimwellsill) veered into the world of hyper-realism with a unique air and delicate quality, incorporating graphic elements representing sound wave movement. To further heighten the brand, this year “Strictly The Best” has teamed up with Beach Roadtrip Weekend (BRT) for a DJ contest that gives contestants the opportunity to join the team as a DJ on BRT’s 2018 tour. The top 5 mixtapes will be judged by followers of the BRT Page via Soundcloud, Instagram, Twitter, Facebook and the website. The finalists of that round will then be invited to the Riviera Beach in Florida this November during BRT Weekend to have the chance to DJ a set for a chance at the final prize. Stream an exclusive Spotify Strictly the Best Playlist here. Established in 1992, Strictly The Best is the longest running reggae compilation series in the business. Following the Reggae Gold release, the annual STB series offers a more comprehensive collection of dancehall and roots sounds that have crossover potential and cater to reggae fans alike. Each year, VP carefully compiles a library of most exclusive dancehall/reggae tunes to keep the pace with the biggest Jamaican hits. Showcasing the most buzz-worthy and talented artists, STB series has been the proving ground for many of reggae's biggest stars including Sean Paul, Mavado, Buju Banton, Bounty Killer, Capleton and many others. If you want to know what the next big reggae hit is in the streets or on the airwaves, Strictly The Best is the only compilation.